We've heard the expression “when pigs fly,” but no one has ever addressed what happens when potatoes fly. Apparently the answer to that question is that fur-wearing Russians ride inside the vegetables while fleeing cops who are in pursuit of vodka. In a new film published on its YouTube channel, Gaboomfilms QC – a group of independent filmmakers from Quebec, Canada – creatively markets the fictional Gaboomskaya vodka. 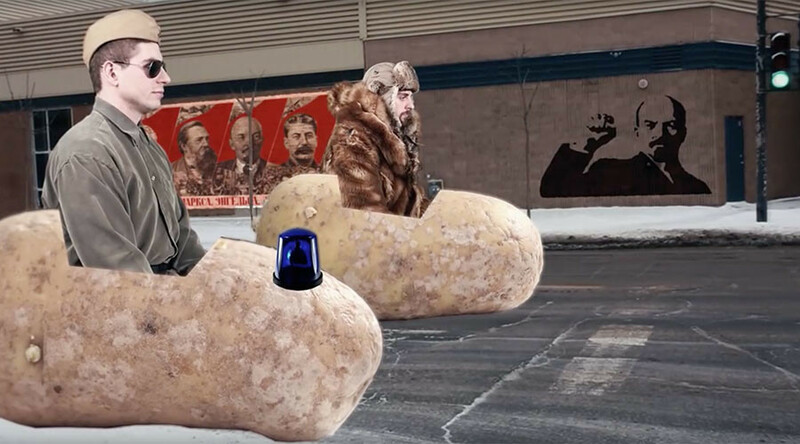 The video begins with the main character driving a potato – because after all, vodka comes from potatoes. He's speeding down the street while taking swigs directly out of the bottle. RT strongly advises against drinking when driving, even if it’s a potato. When a cop – also driving a potato – tries to pull him over, the man puts his vegetable vehicle in fly mode, and takes it to the skies. The officer begins to soar through the clouds alongside the man. But they aren't air-bound forever, because the man's potato runs out of fuel. Both potatoes land safely on the ground, and the cop approaches. While the man likely believes he's about to get arrested for drinking and driving, he's in luck – the cop just wants a sip of his vodka. “You know, it isn't Russian not to share your vodka,” the officer tells the man. The cop takes a swig of the vodka, and they all live happily ever after, even attending a cockfight together. Gaboomfilm QC told RT that the video follows a similar film made by the team last year, which poked fun at Italians living in Montréal. However, the Russian film is a bit closer to home for filmmaker Andrei Tchernilevskii. “We are also aware that many Russians were offended by this video, but it was not our intent,” Tchernilevskii added.